From Paris to Hong Kong, millions of people have kicked off their New Year 2015 celebrations under the night skies brightly lit with firework displays. 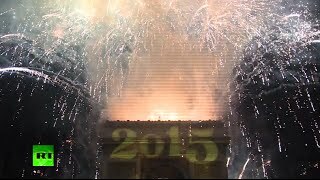 Breathtaking New Year Fireworks: France, Brazil, Turkey & Hong Kong welcome 2015. Breathtaking New Year Fireworks: France, Brazil, Turkey & Hong Kong welcome 2015. Breathtaking New Year Fireworks: France, Brazil, Turkey & Hong Kong welcome 2015. ... Breathtaking New Year Fireworks: France, Brazil, Turkey & Hong Kong welcome 2015.